Your hamster is an engaging little creature who will learn to enjoy interacting with you if you treat her gently. She can't play rough-and-tumble games, but hamsters love a variety of activities that you will enjoy watching. Giving your hamster safe ways to play will help to keep her healthy and happy. It's important to understand your hamster's natural habits. Hamsters must sleep during the day, and are biologically programmed to be awake at night. If you awaken her during the afternoon, she may be cranky, and may bite. Most hamsters begin to stir in the evening hours, and this is the best time to interact with your pet. 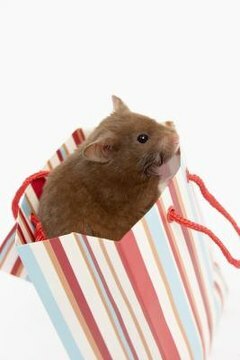 Both the popular Syrian hamsters and dwarf hamsters can adapt somewhat to the schedule in your household, but all varieties will be nocturnal, and forcing your hamster to play during the day will cause her stress. Once you understand your hamster's sleep cycle, you can try games that stimulate her natural curiosity, encourage exercise, and help her bond with you. Hamsters are naturally curious. They explore, tunnel and burrow under things. You can make a hamster obstacle course by connecting tubes from toilet paper or paper towel rolls together, and placing them in a cardboard box. PVC tubing also works well, and is easy to keep clean. Put your hamster in the box, and watch her scoot through the maze of tubes. Shred paper towels or newspaper, and let her tunnel under the mess of paper. Never leave her unattended outside her cage, even if she's in a box. Hamsters can move surprisingly quickly, so you must take care to prevent escape. Your hamster will love running on her exercise wheel. When you choose a wheel, go with one that is solid rather than wire, so toes or legs don't get caught in the metal bars. You may find your hamster loves her wheel so much that she is on it all night long. Check the noise level of the wheel before you buy it. If the noise the wheel makes bothers you, don't keep your hamster in your bedroom. A wire cage offers the best ventilation for your hamster, but she'll enjoy climbing on the walls of the cage. Hamsters can have trouble getting down from things they climb so it's important to make sure the cage isn't tall, so your little friend won't be injured if she falls. A fall of even a foot's height can cause serious injury to a hamster. A plastic exercise ball is a fun toy for a hamster, but it must be used with extreme care. Gently place her in the ball, and make sure the area is free of dangerous obstacles or stairs. She will enjoy running inside the ball, and you will enjoy watching. Do not let her stay in the ball for more than 10 minutes, and never leave her unattended. Hamsters are fragile, and can be easily injured if the ball is accidentally kicked, or if it falls from any height. Hamsters left unattended in a ball without food and water can die of dehydration and hunger. It's important not to handle your pet hamster more than necessary. While she will learn to feel safe with you, she will not like to be handled much. A good game to encourage trust and bonding is to lie on the floor with your hamster on your chest. Let her climb around on you. You can make a "mountain" for her to climb with your hands, or sit cross-legged and let her climb around. You can pet her from time to time, and speak gently to her. She'll learn she's safe around you. With time and patience, you can even teach her to eat out of your hand. Exercise is important for your hamster's overall health and digestion. Gentle games that stimulate her natural curiosity and her love of exploring can help prevent boredom and stress. Syrian hamsters are easier to handle than dwarf varieties, who tend to be more nervous and may nip when frightened. Hamsters are solitary creatures and can entertain themselves, but your pet will still need daily interaction with you. For those times when you can't play with her, make sure she has some hamster-safe toys in her cage, or clean fruit tree branches that she can move around and chew on.